The proportion of mothers of young children under 2 years of age who reported smoking during pregnancy has declined by almost 50% between 1993 and 2008. 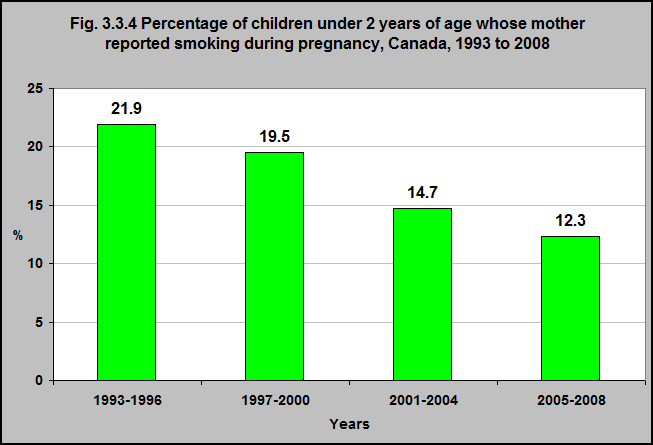 In 1993-1996, 22% of children under 2 had mothers who reported smoking during pregnancy – compared with 12% in 2005-2008. 1Statistics Canada, National Longitudinal Survey of Children and Youth. http://www23.statcan.gc.ca/imdb/p2SV.pl?Function=getInstanceList&Id=56797-accessed July 21, 2017. The negative health effects of smoking during pregnancy on the fetus are well documented – increased risk of low birth weight, still births, spontaneous abortions, decreased fetal growth, premature births, placental abruption, and sudden infant death syndrome (SIDS). It is encouraging that the majority of Canadian women do not smoke during pregnancy and that smoking rates during pregnancy continue to decline. Nevertheless, it is important to continue to have supports in place for those women who may have difficulty not smoking during pregnancy.